Large sections of the Great Barrier Reef, the Earth’s largest living structure, are dying before our eyes. Sustained high sea temperatures have stressed the corals to the point where they expel the brightly coloured algae that live within their tissues. This process is aptly named bleaching as it removes all pigment and exposes the shocking white calcium skeleton of the reef structures. The Great Barrier Reef has experienced bleaching events twice before. The first, in 1998, was bad enough, with 50 per cent of the reef affected. 2002 was even worse with 60 per cent of the reef bleached. Recent aerial surveys of the northern 1,000km of the reef evaluated 500 different sections – 95 per cent were bleached. Many are asking the simple question – why is this happening? First, we need to stress that there was not a single coral bleaching event on the Great Barrier Reef in the 400 years prior to 1998. While the current extreme El Niño is playing a part in this latest episode of coral destruction, the underlying driver is increasing global temperatures as a consequence of human-made climate change. For the algae, a coral reef represents the perfect place to live. There, they are safe and secure within a strong structure, near the surface and so able to receive large amounts of energy from the sun along with coral polyp waste, which helps promote photosynthesis. In fact, photosynthesis is so productive that the algae produce more food than they can consume. This surplus is greedily gobbled up by the coral polyps. It’s a win-win situation – what biologists call a mutualistic symbiosis. However, just like any biological process, there are environmental limits. 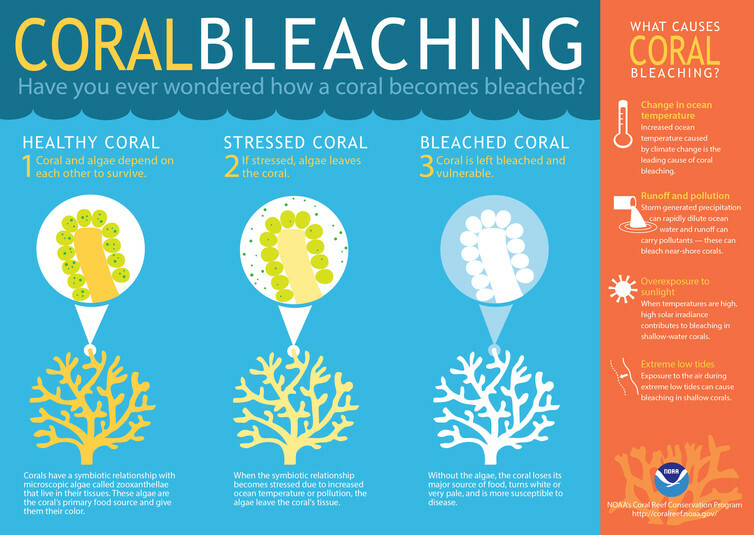 Higher temperatures along with very bright sunshine can impact both coral polyps and their algae and their relationship breaks down, leading to the expulsion of the algae and bleached coral. Given that scientists have been warning about a significant bleaching episode for some time now, one may have hoped for a coordinated response to this predictable disaster. There have indeed been related developments. As if adding insult to injury, the vast majority of the Galilee Basin coal will be shipped out of the deep water port of Abbot Point which is within the Great Barrier Reef UNESCO world heritage site. Those shipping the coal will be able to wave goodbye to the reef in more than one way as they transport it to power stations in India, China and Japan where it will be burnt and so contribute to further warming and further bleaching. James Dyke, Lecturer in Sustainability Science, University of Southampton This article was originally published on The Conversation. Read the original article.